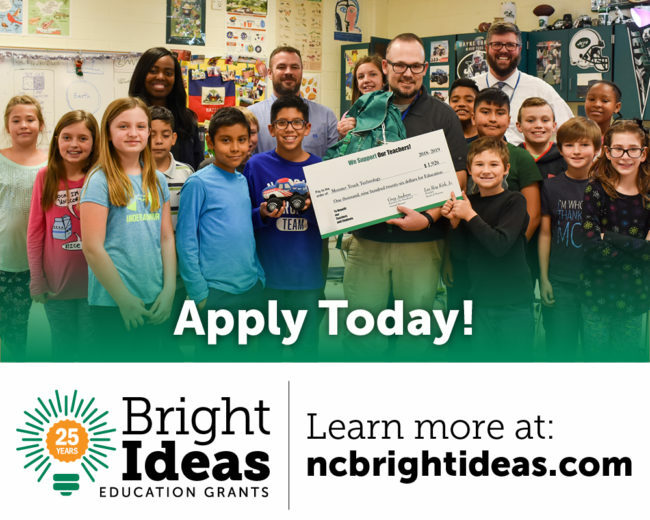 On April 1, North Carolina’s electric cooperatives began accepting applications for the next round of Bright Ideas education grants for creative classroom projects, kicking off a yearlong celebration of the grant program’s 25th anniversary and its impact on students. Educators can learn more and apply online at ncbrightideas.com. Since 1994, electric cooperatives in North Carolina have partnered with educators statewide to provide Bright Ideas grant funding to K-12 educators for projects that bring creative learning to life and engage students in fun and innovative ways. Grants are available to teachers in all 100 North Carolina counties for projects in all disciplines, including music, art, history, language, reading, science, mathematics and information technology, just to name a few. Applications will be accepted through September. Maximum grant amounts and application deadlines vary by co-op. Educators can find information specific to their local cooperative by visiting ncbrightideas.com. Since the program began, educators statewide have received more than $12.2 million in Bright Ideas grant funding, and more than 2.3 million North Carolina students have participated in approximately 11,700 Bright Ideas-funded projects. Learn more about the Bright Ideas program by visiting the In the Community section of our website or viewing our latest Bright Ideas Fact Sheet.